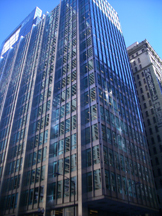 not too long ago i read an article in the tribune about the possibility of the inland steel building being sold off. located at 30 w. monroe street, som designed inland steel was finished in 1958. easily, inland steel is one of my favorite buildings here in chicago; i simply love the way the exterior metal cladding oil cans across the vertical columns playing with and softening the warm sunlight. similarly, the earthy green toned glass contrasts ever so wonderfully against the stainless steel clad columns. 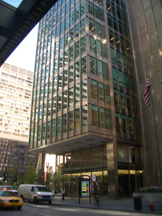 luckily inland steel is an official chicago landmark, and while the credibility of landmark status has been eroding as far as interiors are concerned, inland steel was ground breaking for its column free interior floor plan. the ironic twist to this story is the involvement of frank gehry. apparently mr. gehry was part of a group of investors that purchased the charismatic structure back in 2005 for $44.5 million. mr. gehry claims he was on board under the notion that he would have a hand in renovating the building. currently, the building is expected to fetch $55 million. here’s hoping that any future owners treat the building with the admiration and respect it’s due. today someone pointed me in the direction of a wonderful new blog. 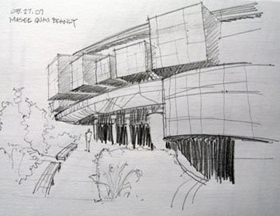 called archisketches, the blog is full of some great architectural sketches full of character as well as insightful and pointed writings about a number of european structures. recently included are bernard tschumi’s (most famous for the parc de la villette in paris) marne school of architecture and jean nouvel’s (whom we’ve talked about recenltly with both his tower in doha and his new condo at 100 11th ave. in new york city) brilliant musee du quai branly. if you haven’t seen archisketches go check it out. last week i was amazed and inspired to read in the new york times, treehugger, and archinect that the infamous trafalgar square in london was greened overnight with over 20,000 square feet of sod from nearby environmentally conscious farmland. the result was vastly impressive but unfortunately lasted only two days. as the times was reporting this was another example of guerrilla gardening; a number of london sites have been greened in the past and apparently the group is working on future sites as well. i thought this installation was incredibly creative, i only wish i could’ve been there to see it and walk through the square while covered in grass. 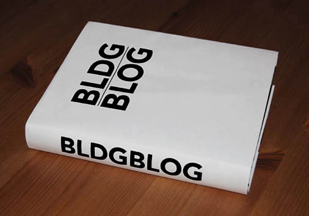 i was ecstatic to read the other day that geoff manaugh of bldgblog recently signed a book deal. congratulations to him; i for one can’t wait to get my hands on it. unfortunately for us we will have to wait until spring 2009 for its release via chronicle books. i’m sure it will be well worth the wait. literally coming mere days after the chicago city council’s final approval of santiago calatrava’s twisting skyscraper is a proposal for a “twirling” tower. not to be outdone by mr. calatrava’s seemingly gracefully moving structure this new design by italian-israeli architect david fisher actually continually rotates 360 degrees. each floor, or block of floors, will literally revolve around a fixed core. 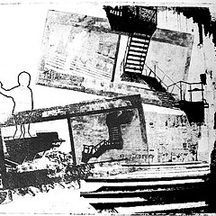 the idea is two-fold, first, the ever-changing volumetric arrangement of the building coupled with the dynamic movement encapsulated in the facade will provide an extremely unique and hopefully engaging aesthetic; or, according to the architect, “one building, many shapes.” second, that as a result of the building’s movement every unit will have a view of the lake as well as the loop and every other vantage point of the city for that matter. naturally, as one can imagine in a town like chicago where even the blue-collar work is an experienced architecture-critic, opinions vary widely. personally, i’ve seen other proposals like this one a much smaller scale and usually associated with sustainable design, typically the rotation of the floors cause by the wind turns a turbine that generates energy (i haven’t heard anything along these lines in this case). 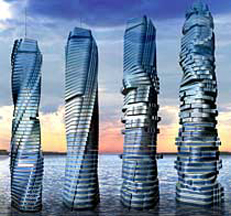 i love the conceptual idea of the tower but i am concerned with the practical aspects that i fear would unavoidably decimate the projects aesthetics (namely structure, unless, of course, it’s built of unobtanium). additionally, i have my doubts about a project like this at such a large scale. admittedly though it is very hard to pass any judgment without more renderings, drawings, and project information; here’s hoping all of which comes sooner rather than later. blackle is google’s new energy saving search engine. google recently launched this endevour in response to a post on the blog eco iron. the post from january of this year, titled, “google would save 750 million megawatt hours,” hypothesized that if google simply changed the backgound of it’s insanely popular search engine web portal from white to black some 750 million megawatt hours of energy would be saved yearly. the math is simple, google gets 200 million-plus hits a day and, “an all white web page uses about 74 watts to display, while an all black page uses only 59 watts.” thus blackle was born. now it’s my understanding that power is only saved when viewing colors through a crt monitor, apparently lcd screen do not discern the difference of color in terms of power used; nonetheless, it’s still a great idea. there’s a great link at the bottom of blackle’s home page that discusses the idea in a little more depth as well as providing some additional interesting tidbits. finally there is a great little counter on blackle’s home page that continually tallies the energy saved by the usage of blackle. “blackle.com – saving energy one search at a time.” every little bit helps. a friend of mine who authors the blog itskleintime forwarded me a very interesting link from treehugger the other day. 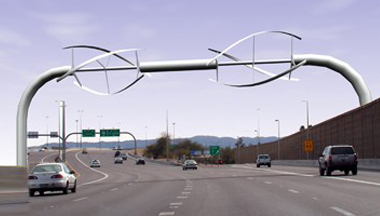 the story is about a wonderfully insightful idea to use the space above our highways as wind farms. not only is this economical in terms of space and infrastructure but its a logical choice for siting wind turbines as cars and trucks increase turbulent wind patterns along the highway. the creative idea comes out of arizona state university. treehugger’s article documents some of the statistical analysis of this proposal including baseline wind patterns that suggest each turbine could power a small apartment for a year. note, however, that this math is done before considering the added wind turbulence provided by vehicular traffic. 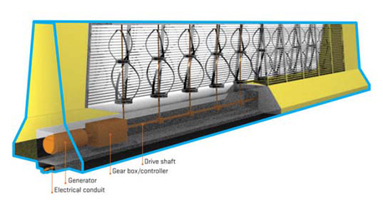 in a similarly creative proposal i found over at inhabitat the ubiquitous, and traditionally heinous, jersey wall is employed to house a series of vertical axis micro wind turbines that generate power from the same turbulent air flow caused by traffic. 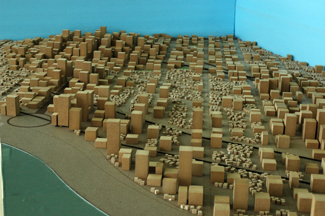 i find both of these proposals extremely creative and wonderfully efficient. using exsiting infrastructure and taking full advantage of wind resources both natural and man-made is, needless to say, a great idea. building integrated wind turbines of this sort can be such an integral part of a fully sustainble approach to building and living and should be pursued with great effort. 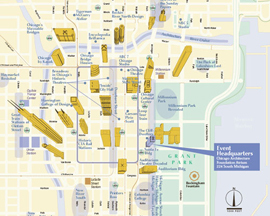 from may 18-20 chicago will once again be hosting the “great chicago places and spaces” event. the event consists of hundreds of tours to and through chicago’s greatest places and spaces (and believe me there are plenty). the tours will be led by notable writers, historians, architects, and other local chicagoans and many of the tours will be to otherwise inaccessible locations and venues. so if you’re in chicago that weekend it’s probably worth registering for this event here. in other local news and events lynn becker at one of my favorite blogs, architecture chicago plus, has another wonderful monthly calendar of events compiled. this month features stanley tigerman at the highland park library, a symposium on jane jacobs, and my personal favorites, the student architecture shows at both u.i.c. and i.i.t. as mr. becker aptly points out, both are on the same night (may 11) which is, “like a subway series, but with buildings!” both shows are free and very accessible via public transit (blue line to uic/halsted for uic or red or green lines to 35th street for iit, additionally the 33rd st. parking lot is free that evening for iit’s show) but iit’s show has the added bonus of taking place in the newly restored miesian masterpiece of crown hall (the above image is 4’x8′ model, with literally thousands of buildings, at iit of a design for a new sustainable city for the gaza strip).